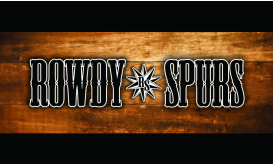 Rowdy Spurs are a traditional, country music band. Influenced by the country legends of George Jones, Merle Haggard, Waylon Jennings and Hank Williams while mixed with a hint of the newer country by Blake Shelton, Brooks N Dunn, Alan Jackson and Garth Brooks. Available for hire as a cover band as well as for original gigs of songs written and preformed by Rowdy Spurs. Check out our channel on YouTube for live videos of our shows.